coromandel preachings: What can I give him? This week we bring the 12 days of Christmas to an end with the Epiphany on January 6th. 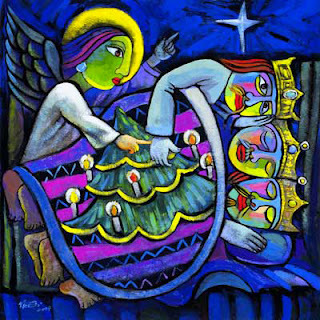 Epiphany means manifestation or revelation and traditionally we focus of the coming of the Wise Men, the revelation of Jesus to the whole world. The manifestation of God to those who are seeking. The showing forth of the mystery of human life in the context of the eternal plan of God. What can I give Him,Poor as I am?If I were a shepherdI would bring a lamb,If I were a wise manI would do my part,Yet what I can I give Him,Give my heart. The words may seem overly sentimental and romantic to us. But that does not mean that they lack truth. The important thing they remind us is that Christmas, the manifestation and knowledge of God....is a matter of the heart. This is not Valentine’s Day sort of sentimentality. the word that will recur again and again God’s story. Are we passionate about God? will cause God to spew them out. and see that we are lukewarm. But it should be the stuff that is in our hearts. What is in our hearts? because of injustice and inequality. Those things that excite and enthuse us. Loving hearts, aflame for God.